This area did not start off as a fern garden but as a shade garden filled with Columbine, primroses and ferns. 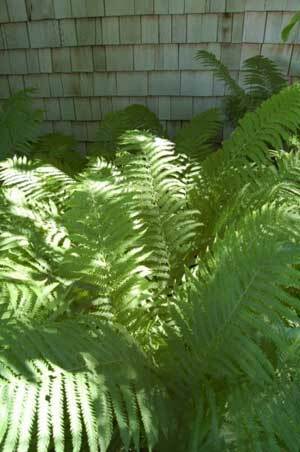 The garden bed actually developed itself into a fern garden over time, and as Katrina saw it “ferns are good.” Perhaps the best-known fern is the notable cultivar of Matteuccia orientalis an edible fiddlehead species, which is also called, Ostrich Fern or the Fiddle Head Fern. This is the type that has naturalised itself in this garden area. 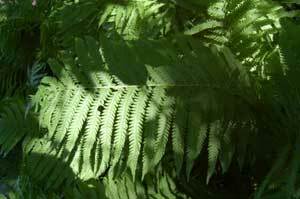 There is nothing mysterious about the basic growing requirements; ferns bring to mind cool glens and shaded forests. This medium-large fern with erect stem thrives in moist shade areas. Attractive vase-shaped clusters of fresh green fronds are produced from a brown cone that is half raised in the ground that is known as the Stolon. 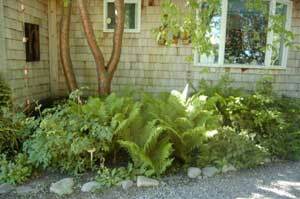 Most often in the Calgary area you will find ferns used as foundation plantings around homes, tool sheds and garages. People often ask if they are the Fiddlehead ferns that they would buy in the store as the cooking green? The short answer is yes. In the Maritime Provinces of Canada, there is a local industry of picking the fiddleheads as they emerge from the ground in the early spring. The fiddleheads are then boiled or steamed for 10 minutes and can be served many ways, but they are usually eaten with just salt, pepper and butter. Be warned cutting the fiddleheads off your plants in the spring season will leave your fern bed looking ragged and the ferns will never fill out for that season. Unless you have a huge area full of ferns it is best just too buy your fiddleheads for dinner. Check out the many other types of ferns that we sell in the perennial department. We are sure that you will surprised by the number of ferns that are hardy in the zone 2 area.